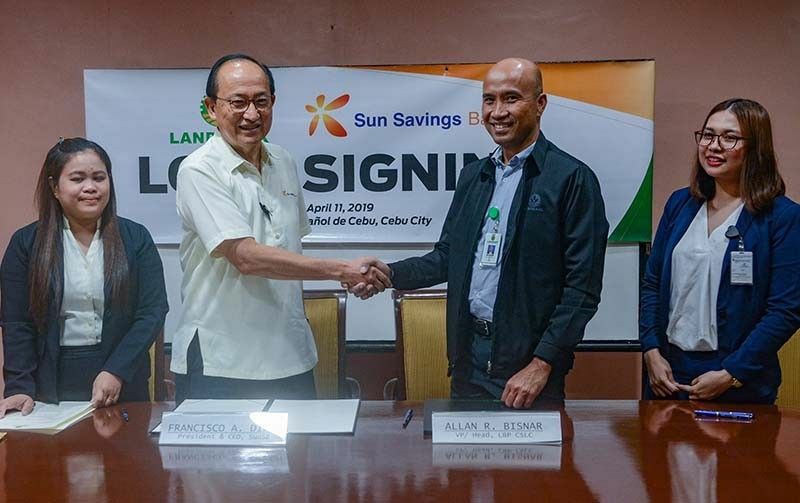 STATE-RUN Land Bank of the Philippines (LBP) has granted Sun Savings Bank a P200-million loan to support the latter’s relending activities in agriculture value chain financing. Sun Savings Bank president and chief executive officer Francisco Dizon on Thursday, April 11, said the loaned amount will be used to boost activities in the agri value chain such as in trading, processing, logistics and marketing of agricultural products. Such a move, Dizon said, is part of the bank’s compliance with the Agri-Agra Reform Credit Act of 2009 being strongly pushed by the Department of Agriculture. “We would also like to participate in the agri-agra lending program of the government but for us to do that, we need the support of the LBP in terms of funding,” said Dizon. The Agri-Agra Reform Credit Act of 2009, or Republic Act 10000, mandates banks to allocate at least 25 percent of their outstanding portfolio to agriculture. Of this, 10 percent should be devoted to credit for agrarian reform beneficiaries. Borrowers at Sun Savings may avail themselves of a maximum loanable amount of P10 million that is subject to prevailing market interest rates, said Dizon. Allan Bisnar, vice president and head of LBP’s Cebu South Lending Center, said the move to tap into government’s resources bodes well for Sun Savings, as this will expand the bank’s portfolio, specifically in the small and medium enterprise (SME) segment. Bisnar added that initiatives like this also help the government redirect these SMEs into the formal channels of lending, instead of them borrowing from loan sharks. Since the enactment of the Republic Act 10000, compliance had been low, as banks hardly lend to the agriculture sector due to the perceived risks. Agriculture Secretary Emmanuel Piñol also blamed the government for low compliance of banks because it failed to guide the banking sector on what projects to fund. In February this year, private banks offered P200 billion in funds to the agricultural sector to comply with the law and boost the country’s agricultural productivity. These banks are Metrobank, Bank of the Philippine Islands, East West Bank, Sterling Bank of Asia, Development Bank of the Philippines and members of the Chamber of Thriftbanks.